Nowadays the politically correct term for an explosive is an energetic material and if you thought the world already has too many kinds of explosives available in quantities too high, please be informed that at least from the organic chemists point of view research into it is very much alive. Just a few examples from the recent literature. Researchers at the University of Idaho go for high density salts as density is proportional to detonation velocity and proportional to the power of two of the detonation pressure (Huang et al. 2008 DOI). Citing Carnelley's rule they argue high density equals molecules with high symmetry. Another contributor to density is the presence of hydrogen bonds. For their ultimate target (a cousin of TNT) they reacted chloranil with sodium nitrite in water to a nitroanilate and then replaced the sodium cations by simple amine cations such as ammonium or tetrazolium . That ions high in nitrogen content contribute favorably to the heat of formation is a notion also advocated by a group of researchers at LMU (Energetic Materials Research). They (Klapötke et al. 2008 DOI) recently investigated picric acid (a well known explosive and a phenol!) pimped up with tetrazolium counterions. The researchers are happy to report that tetrazolium picrates are less sensitive than TNT and also release larger amounts of environmentally friendly nitrogen gas with less carbon soot residue. Equally concerned with eco friendly explosives (...) are researchers from the State Key Laboratory of Explosion Science and Technology at the Beijing Institute of Technology who used diaminotetrazole (DAT, 84% N!) as ligand for cadmium in the novel explosive (Cd(DAT)6)(ClO4)2 (CUI et al. DOI). The publication reports that sensitivity tests reveal that the title compound has sensitive nature but also that Cd is one kind of toxic heavy metal and perchlorate may be a possible teratogen which may limit the utilization of the title compound as energetic materials to some extent. Finally, researchers at the Los Alamos National Laboratory (High Explosives Science and Technology) recently came up with a novel explosive that can be melt-casted below 100°C. Melt casting is another desirable property, one shared with commercially available 3,3,1-trinitroazetidine (TNAZ). 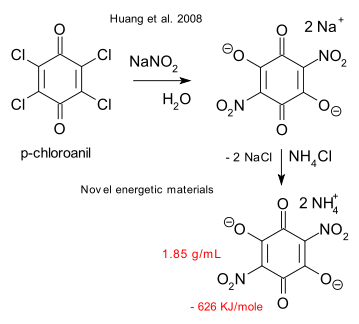 The compound (one related to PETN) was stumbled upon when a Kaplan-Shechter reaction misbehaved. 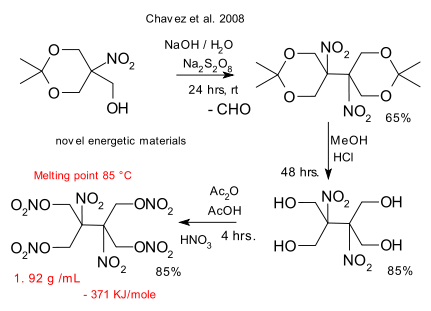 In step one (a coupling reaction) only the sodium persulfate remains as a Kaplan-Shechter reagent.